Nobody knew what to expect at the inaugural MotoGP race in Buriram, adding even more tension and excitement to the atmosphere on the starting grid, and the PTT Thailand Grand Prix certainly didn’t disappoint. Movistar Yamaha MotoGP’s Maverick Viñales and Valentino Rossi were fighting at the front of the field for the entire length of the 26-lap race. Ultimately, it was Viñales who secured a place on the podium, taking third, just ahead of Rossi who finished fourth. 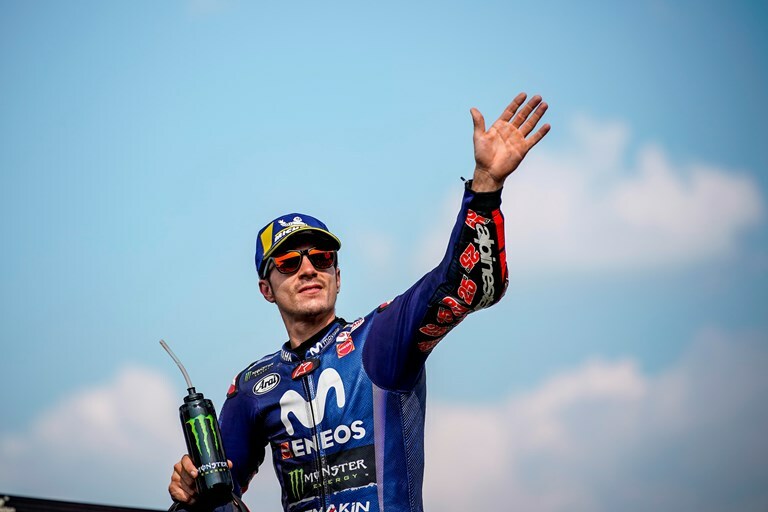 Viñales started from fourth on the grid but lost two positions in the busy opening laps as all riders were vying for a place at the front of the rider field. Having settled in sixth position, the number 25 rider soon started to fight back. He reclaimed fifth position on lap 3, overtaking Johann Zarco, and picked up his pace to tag onto the leading group. The five front riders, including the Spaniard, soon broke away, but the threat from behind wasn’t over just yet. On lap 11 the first three riders started to battle. This allowed the clever youngster to get into the mix, but it also meant that the pursuing field inched closer. The pressure was on the Yamaha rider, but he wasn’t buckling. As the first three riders tried to break away once more, the youngster quickly overtook Cal Crutchlow, and with seven laps remaining, he joined his teammate. A lap later he overtook the Doctor, giving himself a clear view of the leading duo. With three laps to go the fight for the win really kicked off. Viñales was lying in wait directly behind Andrea Dovizioso and Marc Marquez. Though he came just short of putting in a move, he was mighty close as he finished in third place, just 0.270s from first and 0.155s from second. Rossi had a flying start from P2 on the grid and held the position firmly through the first corner. He was on the attack right from the get-go, putting Marquez under pressure, especially in sector 4 before they crossed the line for the very first time. The Spaniard was desperate to shake off the Doctor, but was unsuccessful. The Italian kept running the pace and took over the lead with a brilliant move on lap 5, making the grand stands erupt. The nine-time World Champion held the number one spot until lap 11, when Dovizioso and Marquez pushed him back to third. With seven laps remaining, he was joined by his teammate. Though he had to let Viñales pass one lap later, he kept shadowing the frontrunners’ every move and closed right back in on the final lap. However, an unsuccessful lunge in the final corner meant he remained in fourth place, as he took the chequered flag 1.564s from first. Today’s results see Rossi hold third position in the championship standings with a 99-point margin to first and a 22-point gap to second. Viñales climbed up to fourth place with a 26-point gap to his teammate. Yamaha holds third place in the Constructor Championship after the race in Thailand, with an 88-point margin to first, while the Movistar Yamaha MotoGP Team are also in third position in the team standings with a 40-point gap to first and a 6-point margin to second. The Movistar Yamaha MotoGP Team will be back in action at the Twin Ring Motegi circuit in two weeks’ time for the Motul Grand Prix of Japan, held from October 19th – 21st. With an incredible strong performance Monster Yamaha Tech3 star Johann Zarco fought back to the top 5 in today’s scorching first ever Thailand Grand Prix. Starting from the third row of the grid, the fast Frenchman was quickly inside the fight for the top. Although he got passed later during the race, he fought back very strong to catch the fifth position on the final lap and eventually finish as the best independent rider. Likewise Hafizh Syahrin showed an amazing performance at the hot Chang International Circuit. Launching his 15th MotoGP race from P18, he found an impressive rhythm after the first laps and passed one opponent after another. The Malaysian newcomer to the premier class kept his fast lap times until the finish line to earn the laurels for the best rookie, plus four important points in the championship.